The first year of coeducation brought more than men to the campus. In 1969, the campus newspaper, The Miscellany News, transformed, becoming simply The Misc. Unfortunately, the new name didn't spark student interest as hoped. The 1969 paper was decidedly less inflammatory than its 1968 predecessor, and its passivity annoyed the student body. In Dec. 1969, an editorial noted, "Students around campus are now talking about getting together and publishing another newspaper besides the Misc. Last Wednesday, a meeting was held in Cushing to discuss the possibility and determine the interest among the community." After almost fifty years of publication, the Misc. had lost its following. In November 1970, the Misc. was forced to suspend publication for the rest of the semester "due to lack of funds and student interest." In the same issue, the executive editor announced her resignation. The suspension was a response both to the drastic finances of the paper and to the overwhelming negative criticism circulating the campus. The Misc. hoped that by temporarily depriving the student body of its newspaper, it would stimulate a new appreciation of the paper. Whether the suspension truly provoked a show of support isn't clear. However, the paper returned the next semester with no mention of its hiatus or the criticisms of the community. The only sign of the failed semester was a return to the original title. Six months after the suspension, the paper was back to defending itself from student unrest. A September 1971 editorial said, "A common criticism is that the paper is dull, as it contains little that is not already known, and so is more oriented toward articles on matters such as building renovations. Many have urged the radicalization of the Misc. into a forum for left-wing politics, and anti-administration viewpoints. To be fair, it should be remembered that the ultimate purpose of the paper's existence is to inform the college community… The editorial staff has long ago given up the once popular image of themselves as 'moulders of opinion.' They have perceived a greater challenge in keeping their own biases out of articles on controversial issues, feeling that therein lies their service to the students. Believing that the Vassar student body is not a proletariat in search of a vanguard, articles are presented in a style that allows the individual to form an opinion." Obviously times had changed. The muckraking style of journalism that compelled the editors of the 1960s was gone, replaced by an insistence on objectivity. No longer acting as a stimulus of student action forced the Misc. editors to seek other ways of engaging the community. The paper renounced its previous insensitivity to the college and recognized that as a campus publication, it had a responsibility to publish notices for the college and the VSA. The new affability between the college and the newspaper brought regular commentary by President Simpson to the Miscellany, as well as a column devoted to VSA events. This change in attitude paid off. In 1972, the Miscellany acquired a darkroom, providing a new tool for keeping readers' attention. Pictures quickly peppered the pages of the newspaper. The same year, the layout changed, becoming less disciplined and centered. Editorials were moved into the depths of the paper, as opposed to their traditional second page location, and in their place, a large entertainment section appeared. Sports dominated the back page, and the entire paper took on a casual, haphazard personality. The same year the first Doonesbury comic appeared. The first year after the change, Miscellany recruitment among freshmen skyrocketed, and for the first time the paper had to turn would-be reporters away. Throughout the 1970s and '80s, the formatting shifted with each editorial board. The modern Misc., unlike the paper of earlier classes, rarely commented on its own procedures or changes. Rather, editorials became short comments buried on page six, and The Letters to the Editor section doubled to foster conversation among the community members themselves, rather than between the paper and the community. The modern Misc. supported Unscrewed, Vassar's consumer advocacy paper that began in 1976, leaving investigative reporting to the Unscrewed staff, and often quoting from Unscrewed articles in its own coverage. In 1982, controversy returned to the Miscellany News," this time in a conflict between student organizations and the staff of the paper. In early fall 1982, The Gay People's Alliance (GPA) and the Student Afro-American Society (SAS) met with editors of the Misc. to complain about articles percieved to be of an "ignorant, racist, sexist, and homophobic nature." Later that year, Misc. staff members forced their way into a meeting of the SAS, despite the group's insistence that the meeting remain closed to the press. The SAS and GPA asked for the resignation of the editors. After intervention by the Students' Association, the complaint was settled with a VSA reprimand for the paper. However, soon after, the editorials' section downsized even further, becoming a single column on the far left of a new page entitled "Opinions." This section allowed members of the community to submit their personal viewpoint on any subject, and as long as the opinion was signed and relevant, its publication was guaranteed. The Opinions page calmed student outrage, and soon the Miscellany was benefiting from positive support. A 1984 Friends of the Miscellany News campaign raised $6,000 in new subscription revenues, funding a Rainbow 100A computer for the Miscellany staff. The new computer helped the staff with editing and typesetting, and also allowed for another expansion of the content of the paper. For the first time, a concerted effort was made to include Poughkeepsie and Hudson Valley news alongside national and campus events. Sports coverage expanded as well, now covering three or more pages in the back of each issue. This broadened scope continued successfully through the eighties. With the 1990s came more financial difficulties. At the beginning of the decade, the paper expanded yet again, adding a literary column, a column of politician's quotes, advice, and horoscopes, and incorporating the Vassar emblem into the masthead. Unfortunately, in 1994, a frivolous lawsuit and the negligence of a former assistant treasurer put the Misc. deep into debt. The VSA decided in February of that year that the debt was too large and forced the Misc. to allow the VSA to decide the length of each paper. The February 25 paper was cut from 24 pages to 12, and the March 4 paper was only 8 pages. The April Fool's issue, 16 pages before VSA review, was cut down to 8 pages. Instead of allowing the special edition to go off to print with only eight pages, the editors paid $100 out of pocket to get the rest of the edition printed. The issue came to a head after an angry editorial claimed the VSA had mistreated the paper. The VSA reevaluated its position and returned control of the page count to the Miscellany editorial board. Since 1994, debt and low public support have only hampered the Miscellany News one other time – in the fall of 2002 – but this too was easily resolved, and currently the paper enjoys strong readership on campus and relatively debt-free management. That same spring of 1994, an advertisement for a Holocaust-denying organization made its way into an issue of the Miscellany. Angry protests in the letters to the editor column compelled a reassessment of the Misc. ad policy. "The new policy states that the newspaper will not print any ad which is in violation of legal statues or Vassar regulations, and which does not constitute harassment as defined by the editorial board." With the problems of the spring behind it, the Miscellany began the fall of 1994 with its first email address. By 1996, the paper was online at http:/misc.vassar.edu. The paper became progressively more open at the same time as it moved into the electronic sphere. Since the 90s, almost every issue of the Miscellany News has included an invitation to the entire community to write for the paper. In 1995, a temporary column offered a place to "showcase students', professors', and administrators' non-fiction prose." The paper continues to offer space to all members of the community. In 1996, the VSA Voice column began – once a month, a VSA member updated the campus on the goings-on of the student government. With its push to be more inclusive came countless editorials asking the community to submit material. A 1996 editorial said, "The Miscellany News does not exist within a vacuum – we need support from the whole community. Without members of organizations informing us of events and news, our coverage cannot be complete." In the mid-1990s, the Miscellany also began to publish humorous stories and quips on its final page. At first, the back page held the calendar of school events and classified ads, and over time the writers added funny jokes to each description. From this format came a comedic page that often included satire of the school alongside the calendar. The Backpage continues today, entertaining readers and humorously critiquing the traditions of the school. The Miscellany of today includes the Backpage of the '90s, but it is a far cry from the visually traditional paper that informed the campus at the end of the 20th century. In 2001, two editors of the Miscellany News drastically remade the paper over winter break. "Armed with a box of crayons, a highlighter, three pears, and some back issues of the Village Voice," they created a tabloid format for the paper. "Sleeker fonts, less formulaic layouts, more white space, better graphics, and more pages" combined to make the new Miscellany "a new campus newspaper for a new century." The current Miscellany may look different than the paper of the 20th century, but its content remains basically unchanged. The paper runs the same five weekly sections as it did in 1999: "News, Features, Opinions, Arts and Entertainment, and Sports, as well as a Backpage which includes the campus events calendar and classified ads. [The Miscellany] also has a special Spread section that publishes every two weeks and offers an in depth look at a specific facet of the Vassar community… There are distribution points all over campus, including residence hall lobbies, ACDC, and the College Center." The paper continues to follow the policy that has guided its content since the 1970s. The most recent phrasing of the thirty year old mission appeared in the April 29, 2005 issue: "As the principal campus newspaper, our foremost goal is to provide Vassar with accurate and timely news. To us, the newspaper is a public contract – we strive to accurately report campus events and issues as well as provide a forum for discussion… First and foremost, we report on Vassar College news. Additionally, by reflecting on our peer schools and various events or trends occurring nationwide, we are able to form what we believe to be an accurate representation of the College…. 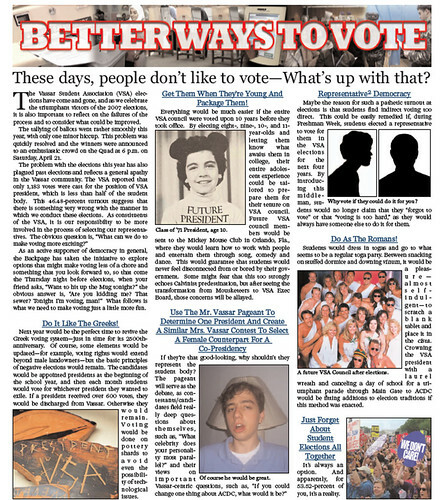 We also address the accomplishments and the events of individual students, campus organizations, and alumnae/i through our Features, Arts and Entertainment, and Sports sections… Our Opinion section is a unique opportunity for the newspaper to provide a forum for discussion with all campus voices…. As a campus and a news source, we have entered into this public contract – may it serve both parties well." The Miscellany News. 1969 - 2006. Vassar College Library.